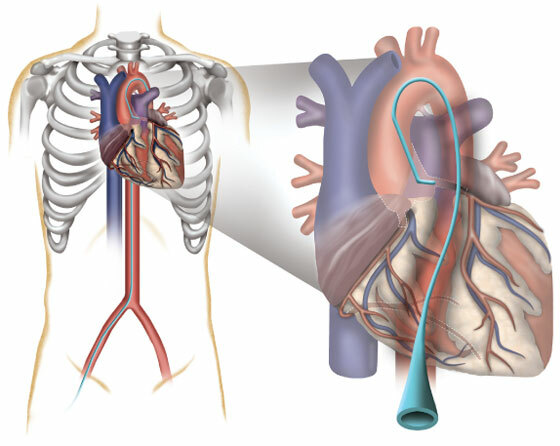 Cardiac catheterization is a procedure where a small plastic catheter is placed within a large artery in your leg and advanced to your heart. This technique is used to take pictures of the arteries of the heart and the pump function of the left ventricle. The procedure provides the most detailed and accurate information on the anatomy of the coronary arteries. Cardiac catheterization is necessary before a decision can be made about bypass surgery or coronary angioplasty. On occasion, for instance, when the arteries to the legs are blocked, the procedure is carried out through an artery in the elbow crease or wrist. This procedure is called an “invasive cardiac procedure” because tubes are actually placed within the body. The procedure is, however, relatively painless. Local anaesthetic is given before insertion of the catheters. You may feel pressure as the catheter is inserted. You may feel a warm sensation throughout your body when the x-ray dye is injected to obtain the pictures. The procedure generally lasts for one-half hour. After the procedure you will be asked to lie still for four hours to allow the puncture site in the groin to heal. There are certain risks involved in cardiac catheterization. These include an approximate 2/1000 risk of serious complications such as heart attack or stroke. As well there is a 2/100 risk of minor complication such as allergy, bleeding, fainting or vascular injury. Ninety-eight times out of a hundred there are no problems. Cardiac catheterization is not indicated in all patients with coronary artery disease. In general, it is reserved for patients whose angina is unstable, in patients who are having angina following a heart attack, or in whom other cardiac testing has shown a high risk for myocardial infarction.